The inaugural run of the Tiger Trail Circuit Train from Delhi Safdarjung Station, being flagged off by the Union Minister for Railways, Shri Suresh Prabhakar Prabhu, through video conferencing on the occasion of the World Environment Day, 2016. The Ministry of Railways has launched a Tiger Express train which has been conceptualized through the personal interest of the Railway Minister himself! 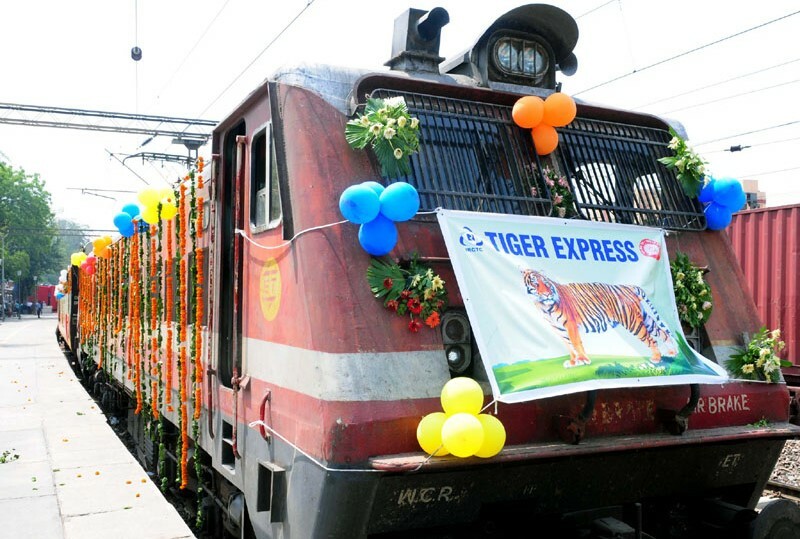 The Tiger Express tourist train will be operated by the Indian Railway Catering and Tourism Corporation (IRCTC). The Tiger Express itinerary for a total of 5 days/6 nights starts from Delhi followed by Katani, Jabalpur, Bandhavgadh and Kanha. The semi-luxury train will take its guests to the world famous Bandhavgarh and Kanha National Parks in Madhya Pradesh. In addition, the trip will also include a visit to Dhuadhar Waterfall in Bedhaghat near Jabalpur. Kanha National Park is known for tigers, deer and the Barasingha. It is also considered to be the source of inspiration for the famous “The Jungle Book”. The Bandhavgarh National Park is known for its biodiversity and a healthy tiger population. The park also has a large breeding population of leopards and various species of deer. The package includes journey by the exclusive semi luxury air conditioned train, accommodation in air-conditioned rooms of three star equivalent hotels for three nights (one night in Bandhavgarh and two nights in Kanha in Mogli Resorts), sightseeing and road transportation by AC vehicles, buffet meals, game safaris, inter-city transfers and travel insurance. The itinerary has a tariff structure starting from Rs 38,500 to Rs 49,500 for single occupancy. An additional surcharge of Rs. 4,000 per person will be charged from foreigners for the Safari booking at Bandhagarh and Kanha. Speaking on the launch ceremony of the Tiger Express, Railway Minister Shri Suresh Prabhu said that Indian Railways is fully committed to address environmental issues. He pointed out that since assuming charge, he has taken a number of initiative to create a separate, dedicated Environment Directorate in the Ministry of Railways. Referring to the Tiger Express, he said that the tiger is at the apex of the food chain and so has tremendous ecological impact. It is therefore befitting to launch a train focused on this subject. He also shared that more such tourist circuit trains, e.g. elephant circuit, desert circuit etc. are also being planned. Online booking of Tiger Express train can be done through the IRCTC Tourism Portal or vie email (tourism@irctc.com). Toll-free number for the same are: 1800110139 or 9717645648, 971764718, 9717640219, 9717644085, 9717645625.